The premature baby into the walker, like let underage kids driving cars, is a very dangerous thing. Britain had research data show that the ratio of injuries occur when baby walker is much higher than with a probability of occurrence of accidents with other baby supplies. This is because the walker make baby too quickly, the height is too high, thus exponentially increasing the danger. Survey shows that most injuries occur because of events in the following categories reasons: First, tilt the baby will be upset walker fell down stairs, or hit the furniture, heater or stove and so on. Secondly, the use of a walker, the baby may be past the reach of things (such as candles and hot cups, etc.) burns. Finally, the walker can be enough to make your baby in a safe position in the past families of toxic substances, such as perfume, mouthwash or alcohol. Just as many parents think of it, people will mistakenly believe that the baby in his small "car" in the busy time is safe, do not take care of people in a short time. But in fact, when your baby is in the baby walker time, but you need to be especially vigilant. And let stay in the baby's room without danger of the floor, he will be more secure. Moreover, excessive use of a walker or even may also slightly delayed his development. Despite the worrying statistics, but a complete ban is not realistic walker. 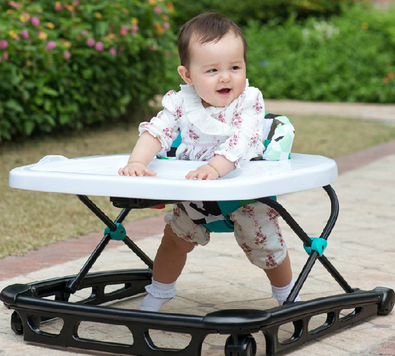 Some experts believe that the walker should be only for nine months or more baby designs, baby this age have been able to sit and crawl, and adults pay attention to controlling the baby's speed of action. In addition, when customers buy Baby Walkers, must be clearly safe use guidelines. If someone recommends you to buy baby walkers, you should first consider other alternatives, or better to let the baby with the traditional good way: on the floor exercise it.